My Rescue Story: Good Sad News! So everything has been going on just great this summer. Trips to the beach, trips to the spa, some days, just being lazy on the deck. Penny moved in with us and has completed her Glam Squad Makeover. If you don't know, a Glam Squad Makeover includes a spa treatment and a trip to the Dr for a checkup and shots and then surgery to make sure we can't reproduce. Last night all of us had a family meeting. Momma put all of us on the bed & we had a talk. Well, she talked, we listened. She said that Penny was going to be moving out. She said she was moving to a new home with her own family. It has nothing to do with us not loving her (cause we do), it's just that we are not the family she is supposed to be with. 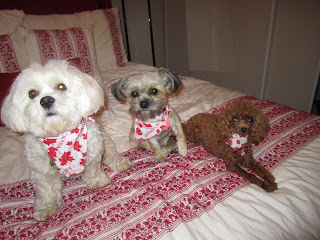 Momma said that Penny's new family had no dog at all, and that she would have lots of love and excellent care forever. It makes us sad that Penny won't be with us anymore, but Momma has proven to be very trustworthy and smart in the decisions she makes for us, so I trust her. Momma told Penny that she was a very good girl and that she knew she would be a very good girl at her new home too. She said that we still had a few more days together until Penny left. We all kissed Momma, even Cracker and he never kisses anyone. And then we all kissed each other. Momma said we could stay on the bed for a while and we played a little bit & then had a nap. PS: Momma said she has a surprise for me tomorrow!